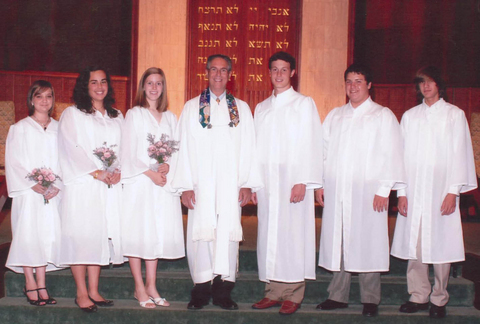 Rabbi Stevens appears in the photo above with (left to right) our 2008 confirmands Sarah Lieberman, Laura Levy, Jenny Wool, Dustin Weil, Scott Harris and Jake Herring.Confirmation was introduced into Jewish life by the Reform Movement in Germany, nearly 200 years ago. As the service that celebrates the culmination of years of religious school, Confirmation has become an occasion of rejoicing, and is today followed by many Conservative congregations as well. At Temple Beth Or Confirmation represents the culmination of religious school, usually at the end of tenth grade. Yet one’s religious education never truly ends, for where the formal school program leaves off, the full range of adult education opportunities becomes available. In this sense Confirmation represents another stage in a program of life-long Jewish education. The Confirmation class is a two-year program, and is run jointly with students at Agudath Israel / Etz Ahayem. The class is taught by both congregations’ rabbis, either together or in alternation. The two-year course covers basic Judaism (life-cycle, the Jewish year, Jewish history, theology, prayer, ritual and contemporary Jewish life) as well as special topics reflecting the students’ interest. These have included such topics as Anti-Semitism, cultic proselytization, differences between Judaism and Christianity, issues of bio-medical ethics and Jewish sexual values. The Confirmation class has also held sessions with high school students in the church community. At the end of the program, we celebrate Confirmation in the context of Shavuot, the Jewish holiday that celebrates the spring harvest and is tied to the giving of the Torah on Mt. Sinai. Students participate in planning the service, and might be asked to do a mitzvah project, read Torah or prepare a D’var Torah (Torah-related sermon). At Temple Beth Or it is our hope that our young people will choose to go through confirmation, thereby laying the foundation for a life-long love of Jewish learning.